If you’re more of a FriendFeed rather than a Twitter user, you might find FeedStats an intersting analytics tool for your FriendFeed account activities. Twitter users would immediately notice that FeedStats is similar to the Twitter visualization tool TweetStats. FeedStats is a FriendFeed visualization tools that tells you how your FriendFeed account interact with the whole of FriendFeed Stream including with other FriendFeed users. Specifically, it allows you to find out what services your FriendFeed friends are using, when they post, and who interacts with their content the most. Similarly, if you have a FriendFeed account, you can also see the same visual information for your account. FeedStats utilizes the FriendFeed API. You can view others FriendFeed activity visualization without loggin in to your FriendFeed account within the FeedStat site. But if you want to use other FeedStats features including one-click following of other FriendFeed users. 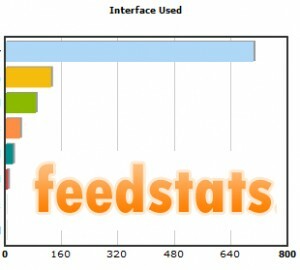 FeedStats provide awesome graphs about your FriendFeed account activities. Best among these graphs is the Like Compatibility Index complete with top 10 suggested FriendFeed user that you might want to connect with in FriendFeed. Interestingly, one cool feature of FeedStat is the ability to hide Twitter feeds that you connected to your FriendFeed account. Although, I’m not really sure why you would want to hide your Twitter account, it could be a useful feature especially if more than half of your newsfeed are fed by Twitter to your FriendFeed account. Overall, FeedStats is a pretty cool web analytics tool for FriendFeed. Check it out and find out for yourself how robust this tool is. Or check out my FeedStats info.